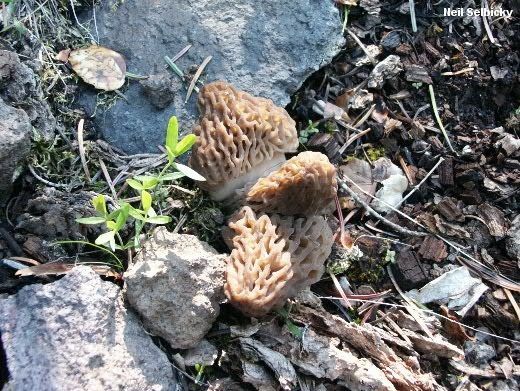 This is one of western North America's so-called "natural" morels--which means it appears in non-burned forests, rather than landscaping sites or burn sites. This fact, along with two physical features (the ridges and the stem), makes Morchella snyderi relatively easy to identify. The ridges on the cap of Morchella snyderi are initially yellowish--yellow enough, in fact, that the species is often mistaken for a yellow morel. 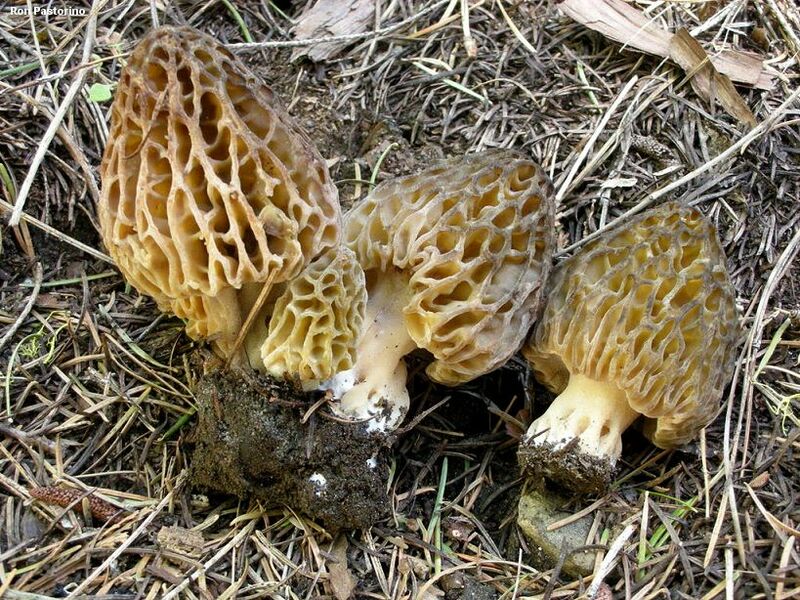 But the ridges usually become dark brown to black over the course of maturation or when dried, and collectors often find Morchella snyderi in a sort of transition stage, in which the ridges are yellowish toward the bottom, but have begun to blacken toward the top. The other distinguishing physical feature of Morchella snyderi is its stem, which usually becomes strikingly ridged and pocketed ("lacunose" in Mycologese) as it matures. 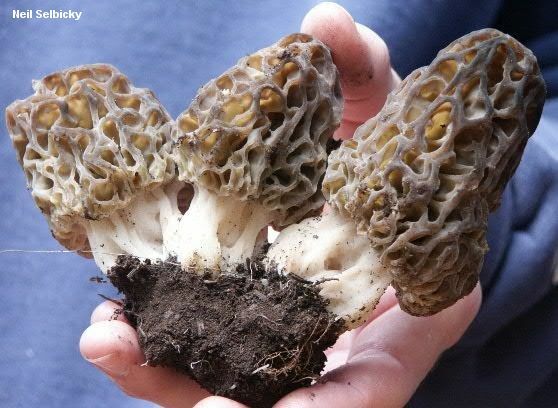 Yes, virtually any morel can develop such a stem when it sits unpicked for many days in warm, wet conditions. 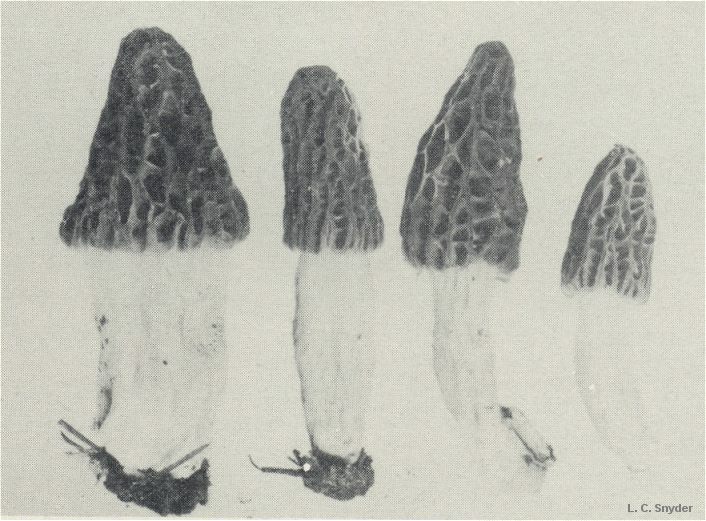 But the stem of Morchella snyderi does so with regularity in the normal course of development, and mature specimens usually feature the ridges and pockets. The proper name for this species should have been Morchella crassistipa--a species named in 1938 by L. C. Snyder, in the state of Washington. But DNA testing of Snyder's type collection, reported in Kuo and collaborators (2012), revealed at least two separate phylogenetic species within the type, and we were unfortunately forced to designate Snyder's species name as doubtful. One of the specimens Snyder saved as a type matched the mushroom I am describing here, and this specimen is probably (not certainly, but probably) the left-hand specimen in Snyder's original illustration, which clearly has a pitted and ridged stem, too. Because I did not want Snyder's important work on this species to be forgotten merely because he did not recognize potentially morphologically indistinguishable, DNA-defined morel species in 1938, I chose snyderi as the new epithet for the species. Ecology: Possibly saprobic and mycorrhizal at different points in its life cycle; growing alone, scattered, or gregariously under conifers (including ponderosa pine, Douglas-fir, and white fir); April to June; possibly widespread in montane western North America (documented from California, Idaho, Montana, Oregon, and Washington). Cap: 3.5-8 cm tall and 3-5 cm wide; conical or broadly conical; pitted and ridged, with the pits primarily arranged vertically; when young with bald or finely velvety, flattened, yellowish ridges and similarly colored pits; with maturity the ridges becoming sharpened or eroded and darkening to brown, gray, or black, and the pits becoming tan to grayish brown; attached to the stem with a small groove (2-4 mm deep); hollow. Stem: 3.5-7 cm high and 2.5-4 cm wide; equal, or slightly swollen at the base; whitish to pale brownish; finely to coarsely mealy with granules; usually becoming prominently ridged and pocketed; hollow. Microscopic Features: Spores 25-37 x 15-23 µ; smooth; elliptical; without oil droplets; contents homogeneous. Asci 8-spored. 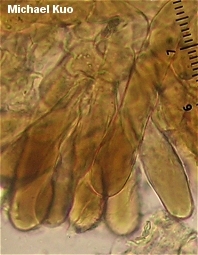 Paraphyses cylindric with variable apices; septate; hyaline to faintly brownish in KOH. Elements on sterile ridges 75-175 x 10-20 µ; septate; hyaline to brownish in KOH; terminal cell cylindric with a subclavate, clavate, subcapitate, or widely fusiform apex. SPECIMENS EXAMINED: Herb. F. 06100108, 05120404, 05140401. Herb. OSC 139277 (holotype), 139279, 138276. Herb. SFSU R. Ower #5, R. Ower #8. Herb. UC T. D. Bruns 1765, 1860810. Kuo, M. (2012, October). Morchella snyderi. Retrieved from the MushroomExpert.Com Web site: http://www.mushroomexpert.com/morchella_snyderi.html.